Is Dyeing the Chicago River Green Eco-Friendly? 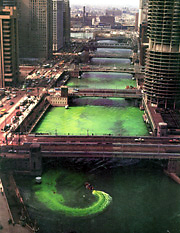 Parade day in Chicago on St. Patrick’s Day means dyeing the Chicago river Green! That’s right, every year a small boat goes out on the Chicago river dumping in 40 pounds of green dye turning the river a bright green for four to five hours. This maybe fun and festive, but is this eco-friendly? Story has it that in 1966, the environmentalists accused the parade committee of polluting the river, complaining that the dye was oil-based and was detrimental to all living things. Since then, the committee uses a vegetable dye. But what is really in the dye? The formula for the dye is a closely guarded secret, so the public will never know for sure, however the committee does insure us that the dye has been thoroughly tested by independent chemists and has been proven safe for the environment. The Chicago parade will be on Saturday, March 15th 2008 staring at noon and the dyeing of the river starts before that at 10:45.
what effect does vegetable dye have on the inhabitants of the river? and what about the tributaries of the river? how do they get it out? im so confused and slightly shocked.